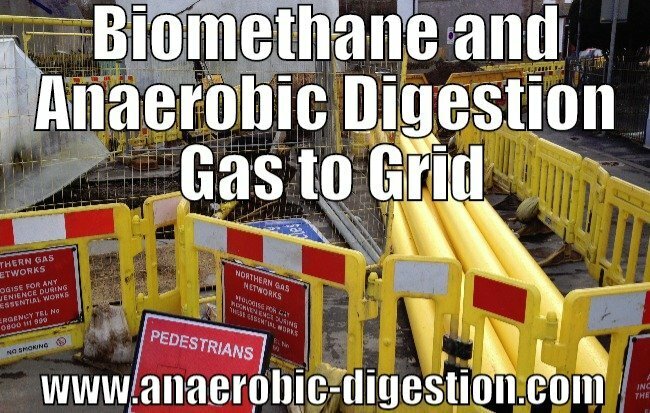 It is a good question to ask; “What is biomethane and anaerobic digestion gas to grid”, but for the first part (biomethane) don’t expect always to get the same answer! Many people use the term biomethane interchangeably as if it means the same as biogas. In fact, when the term “biomethane” is used correctly the word is reserved to mean just the purified methane which is left after biogas has been cleaned up. Biomethane is the product produced when the raw biogas from the anaerobic digestion process is upgraded (purified to a high standard) in an additional process or processes, and usually is also compressed to suitable pressures for use for storage in cylinders and on many occasions injection into national or regional natural gas networks. DEFINITION OF GAS TO GRID: Is simply conveyancing of biomethane gas into the national or regional natural gas network. Stringent quality requirements apply. The topic of biomethane and anaerobic digestion “gas to grid” (as it is called) is one of increasing importance as the push toward decarbonisation and implementation of the Paris Climate Change Summit moves forward. The growth in production and use of biogas, that the move toward producing really very pure methane will encourage, is highly sustainable. That is not only due to the renewable source of this energy, but also because it burns clean. So, it can also alleviate air pollution problems when used as a transport fuel. Until now, raw biogas has been used to run generators usually situated at the AD plant, and that’s not nearly as environmentally beneficial, due to (among other factors), the power losses inherent in all electrical distribution networks. By contrast, the renewable natural gas substitute “biomethane” when injected into the gas grid, will naturally be used locally, and the energy losses of electrical distribution systems simply don’t occur. When used as a transport fuel, the fuel is used locally to its point of production, and similar efficiency improvements also occur in using anaerobic digestion gas to grid technology. There is no doubt that developing the production and use of biomethane has many great advantages, but the implementation of a rapidly rising biomethane and anaerobic digestion gas to grid infrastructure throughout Europe will need careful planning. it is suggested it will need both a register to ensure quality, and an ability to use mass balances and to track the biomethane from its production to its use. In the rest of this article we provide a discussion of the requirements of biomethane and anaerobic digestion gas to grid systems before they can be implemented on a very large scale and actually begin to make a difference for climate change reduction. What is the role of EBA in the Biosurf Project? Well EBA is responsible for several working packages, it’s responsible for WP3 World Package 3 which is the one on biomethane trade, and also other work packages related to communication, dissemination of project results, organizing seminars and conferences and also the political impact of this project and doing research, reviewing basically current legislation which impacts on the production of biomethane and also its utilization in Europe. What are the current and future perspectives of biomethane in Europe? Well, the perspectives are bright, on the other hand it’s a tough job: anaerobic digestion gas to grid, has a great technical potential, but to realise this potential and to enable production of more than a hundred billion cubic metres of biomethane, which is roughly the amount we are talking about in a long-term perspective coming to 2050, then it really needs a lot of effort, legislative changes, and support, and if we really will be working on that issue, we can go step by step up to the goal for 2030, which we drew up in our vision document, it’s to enable production of roughly 50 billion cubic metres of biomethane and biogas together annually. And of course, this means that the next 15, 16 years will require a lot of heavy work in the legislative field. What is the European Renewable Gas Registry? This is an extremely good and very new initiative. It was established today in Ghent. This was established by nine partners from eight European countries. Hopefully one day we will have more partners from a lot more countries. The European Renewable Gas Registry has the main function of enabling the usage of the European natural gas network for distribution of the anaerobic digestion gas to grid product. In order to be able to use the natural gas network, you must have a very solid mass balancing system. The volumes have to be tracked. You cannot track the volumes physically because our product is blended with natural gas and cannot be differentiated. So we have to have an administrative system which virtually moves the product from one country, one end of Europe to the other end. Basically, mass balancing is the method to do this. The idea is to have a European system recognised by the European commission. According to the Renewable Energy Directive, there is a set procedure for recognising such voluntary schemes. And we think that if we put together proper documentation, it must be transparent, it must be neutral and professional, audits should be there, and a lot of other conditions. If you do it properly, we will apply to the European commission, they will recognise this scheme as meeting the legislative requirements and then we will have a very important tool which will help us opening the pipeline network for our product. How is it linked to the national biomethane registries? As close as possible. The idea is that we do not want to have a new registry, which would mean that we have a single point where we register all the producers, all the traders, everybody all over Europe in every country. And it is not needed, because the Austrian producers and the volumes are registered today in Austria, the German producers and consumers are registered today in Germany. So the national registries act on their national territories. But we want to build a network of the national registries, relying on the information coming from the registries. And bases on that data, we want to have the European mass balancing. But this will change the role and the activities of the national registries today because today they only handle the domestic territory. They are not really too keen on what is happening at the other end of the pipeline. But tomorrow, imagine there is a registry in Austria, and they are receiving a biomethane consignment from Romania, the Austrian registry will have a function related to the imported product also, not only to the produced and exported but also to the imported. What is the European Renewable Gas Registry? This is an extremely good and very new initiative. It was established today in Ghent. This was established by nine partners from eight European countries. Hopefully one day they will have more partners from a lot more countries. The European Renewable Gas Registry has a main function of enabling the usage of the European natural gas network for distribution of this product. In order to be able to use the natural gas network, you must have a very solid mass balancing system. The volumes have to be tracked. You cannot track the volumes physically because our product is blended with natural gas and cannot be differentiated. So we have to have an administrative system which virtually moves the product of anaerobic digestion gas to grid, from one country, one end of Europe to the other end. Basically, mass balancing is the method to do this. The idea is to have a European system recognised by the European commission. According to the Renewable Energy Directive, there is a set procedure for recognising such voluntary schemes. And we think that if we put together proper documentation, it must be transparent, it must be neutral and professional, audits should be there, and a lot of other conditions. If you do it properly, we will apply to the European commission, they will recognise this scheme as meeting the legislative requirements and then we will have a very important tool which will help us opening the pipeline network for our product. How is it linked to the national biomethane registries? As close as possible. The idea is that we do not want to have a new registry, which would mean that we have a single point where we register all the producers, all the traders, everybody all over Europe in every country. And it is not needed, because the Austrian producers and the volumes are registered today in Austria, the German producers and consumers of anaerobic digestion gas to grid, are registered today in Germany. So the national registries act on their national territories. But we want to build a network of the national registries, relying on the information coming from the registries. And bases on that data, we want to have the European mass balancing. But this will change the role and the activities of the national registries today, because today they only handle the domestic territory. They are not really too keen on what is happening at the other end of the pipeline. But tomorrow, imagine there is a registry in Austria, and they are receiving a biomethane consignment from Romania, the Austrian registry will have a function related to the imported product also, not only to the produced and exported but also to the imported. But the whole system must be based on the work of the registries, and there is still a lot to be done to have those registries. Normally I don’t read article on blogs, but I wish to say that this write-up very pressured me to check out and do it! Your writing style has been surprised me. Thanks, very nice article. Get high efficient gas system with hollow sunlight sheet greenhouse and pad for insulation and heating that can use the waste heat from the electricity generator to heat the digester, and circulating pumps for raw material and anaerobic digestate mixing. Gas to grid if you like. What’s up! The contents at this website are in fact amazing for people’s knowledge. I had said to myself biomethane must be just that “biological methane” i.e. biogas. Not so you say. Yep. You’ve gotta clean up the biogas before it can be called biomethane. Well, it’s logical, so keep up the good work fellows. I wish to comment to you a few words just to say thanks for the amazing knowledge on this page. Biomethane production and anaerobic digestion gas to grid is a development which is of great interest and show just what improved technology can do. You realize a lot. I can’t argue with you. Bacon producers with extra cash might consider biomethane production. But why not go for direct conversion to electricity to go right on the local supply system with some guarantees of recovery of initial investments? The big news in India at recent center stages is the Kerala floods. These were ‘very serious’. Kerala saw impossible water flow on friday to handle floods. Floods that’ve overloaded half their state, left not less than 40 human beings extremely badly injured and also deaths. Major minister Pinarayi Vijayan called it the worst injury to befallen the southeast indian circumstance plus costing 35 million. The climate change is very serious in India, so tell your readers to make the renewable energy a lot, because in India the weather news is very bad without.